Mother Nature with hurricane Matthew threw us a curve ball and my highly anticipated rug hooking workshop had to be cancelled. Our teacher, Cammie Bruce, was unfortunately in his path and her home was evacuated two days prior the workshop. 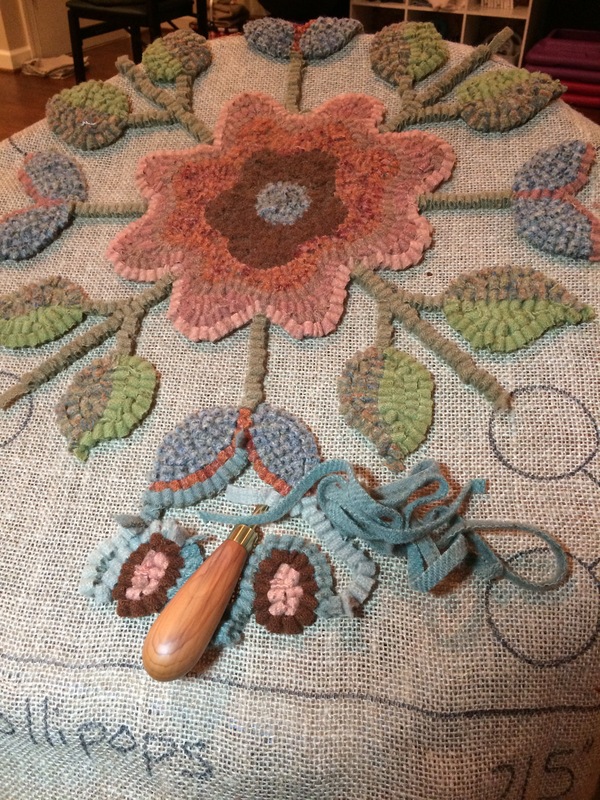 Unfortunately we had to cancel ( but it will be rescheduled) our 3 days of rug hooking and instruction but fortunately for Cammie, her home was spared. Much of her small, quaint, resilient town was flooded and now in the long process of recovery. Because I have tons of projects in my queue, I picked out a Cammie Bruce design to work on…after all I had the time blocked on my calendar. So I invited the workshop group to my house and some of us hooked anyway. “Tulips and Lollipops “. These are Cammie’s hand dyed wools too…lovely soft, vintage colors. 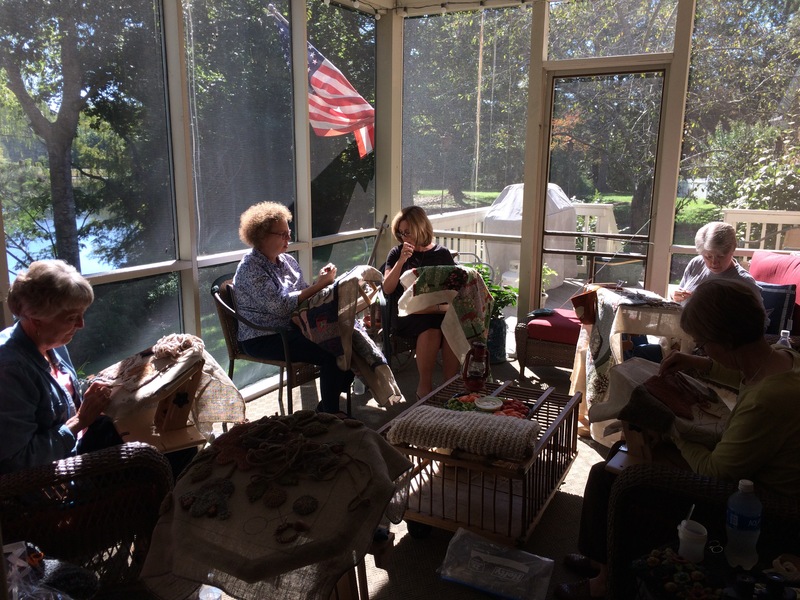 And here are some of my fellow “hookers” doing their work on my back porch…it was a lovely fall day! Hockey season has started meaning there will be lots of travel on I-95 in the coming months as we watch our Washington Capitals. This is our 9th season of tickets, each year we say it’s the last…but it’s not! This means I need handwork for the car. I’m in the quilt assembly stage for My Crazy Life by Primitive Gatherings. 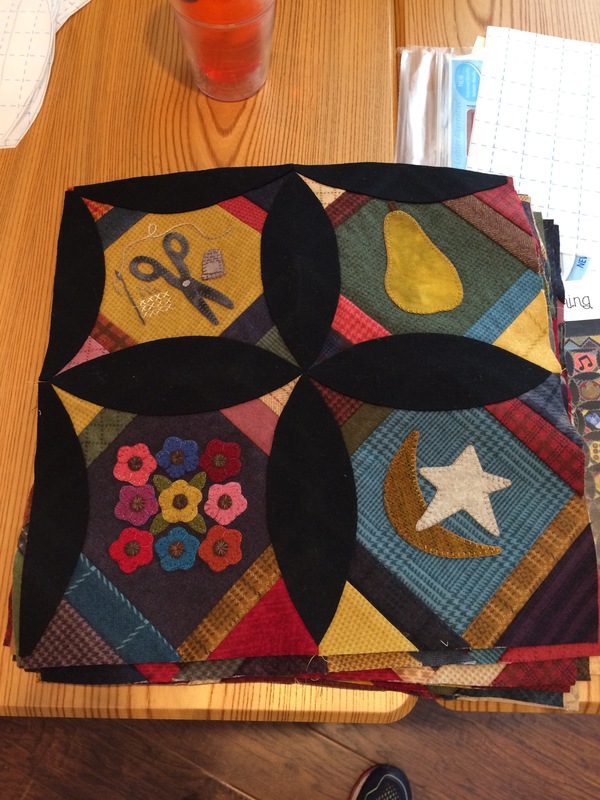 It’s a wool appliqué on cotton flannel quilt that we started at the beginning of the summer. Each week we received 4 blocks and I’m happy to say I was able to keep up with them…the assembly now is slowing me down…lots of handwork….perfect for hockey season. I have the blocks sewn into groups of 4 and am now adding the black wool “pumpkin seeds”.